Use key limes or Mexican limones for best flavor—REVISION: actually, “regular” lime juice tastes just the same and is easier to extract. This is a classic recipe. The multiple teaspoons of zest really make it exceptional, but only for palates desirous of sharp citrus flavors trumping the sweetness. This is a morning or next-day recipe, so the pie has time to cool thoroughly in the refrigerator. It’ll take a while to do the zesting and squeezing, so do them first. Then preheat oven to 350°F. Use food processor to turn crackers into crumbs, and mix crumbs with sugar. You can use cinnamon-and-sugar topped grahams for a subtle change in the crust flavor, but decrease the sugar by a teaspoon so the crust doesn’t fuse. 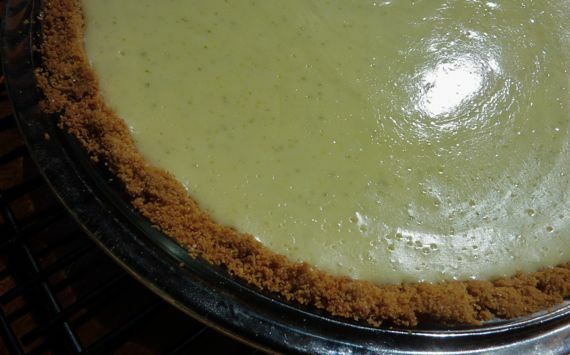 Add the melted butter (microwave makes melting easy) and mix to thoroughly incorporated dry ingredients, then press into 9-inch pie plate (glass is best). Pop crust into oven and bake for 10 to 12 minutes until slightly browned. Remove, leaving oven on. Begin by whisking milk and yolks together (by hand is fine). Then add juice and zest, whisking until the mixture is homogeneous. It will thicken a bit as the juice reacts. Pour into graham crust (doesn’t have to be cooled), and bake about 12–15 minutes until filling is set, although center can be slightly jiggly. Cool at least 4 hours or overnight. You can top it with meringue (using up the egg whites), whipped cream, or enjoy it plain. Otherwise, use leftover egg whites in scrambled eggs or another dish.